This past weekend and the early part of this week was spent giving my office a makeover. When we moved into the new location, we had the typical builder’s white walls, so the space itself felt almost “institutional” and sterile and it was starting to drive me crazy!. 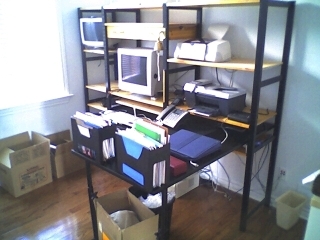 The office furniture that we’d moved into the space (you can see the before picture below) was the same IKEA IVAR furniture I’d had since 1991. To be perfectly honest, I love IKEA! I think their modular furniture lines are great for office spaces, as you can configure them to fit your space and your needs, rather than you having to adapt to more standard furniture lines. My old IVAR stuff comes as unfinished pine, and I had black lacquered the side rails, and had finished the shelf pieces with a clear Varathane. 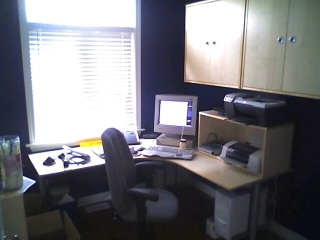 A black lacquered oak desk surface completed the setup, and this had been my workstation for years. That IVAR stuff has been with me through 5 different moves, being reconfigured to fit different spaces each time. But over the years, my needs had been changing, and I made additions to the setup, and in some ways things weren’t working as well for me. Over the last three years, I had learned a lot more about ergonomics in an office environment, and my IVAR stuff (the way it was configured) wasn’t the best setup. Add to the fact that the colour scheme was a bit too “industrial-looking” (read: bachelor tacky) for my wife, and it was time to make this office space something that would suit both of us. So, we made a trip to IKEA to pick out and order some furniture. I had seen a colour scheme in a catalog that I really liked (cobalt blue walls with clear finished birch furniture), so we chose some nice birch pieces. If your not familiar with IKEA’s office furniture, you should really check it out at www.ikea.com. We chose some pieces from the GALLANT series of modular desks, and some EFFEKTIVE file and wall cabinets. Then we headed over to Rona to buy the paint. I spent the weekend priming and painting two of the four walls cobalt blue. The other two walls will stay white, to offset the blue, and keep the room from feeling too dark and small. Once the paint had dried, I spent Monday building and hanging the wall cabinets, and Tuesday getting all the desktops and file cabinets going. The nice thing about the GALLANT series of desks at IKEA is that they have (optional) metal CPU holders that mount under the desk to get the CPU box off the floor, and you can also get under-mounted cable management solutions. It makes the set-up a lot cleaner looking, and you don’t end up with a “spaghetti factory explosion” underneath your desk. Being that I have a background and interest in computer-based audio/visual work, my computers have a lot of cables hanging off of them! Plan for plenty of storage. If some of your storage needs are to hide “non-pretty” stuff, plan for cabinets or bookshelves with doors. Make sure you have sufficient space for equipment, laying out books and writing materials, and other needs. Go for “levels” if you need more space, buy getting items up off your desk if they don’t need to be at the same level. See the printers at the right hand side of the picture for ideas. Measure, measure, measure. Measure everything, and try to layout a floor plan before you go shopping. IKEA has some nice paper and computer-based design and planning tools, so make use of them. Make sure you buy stuff that will fit your space and your equipment. Pick colours that you’re going to be happy looking at for 7 hours a day. Lighting also plays a part in colour and your moods, so make sure your lighting is both appropriate to the task, and to your colour scheme. There’s a lot more to planning an effective space that just those points, but those are things I think sometimes get overlooked in the shopping spree. Spring is a natural time for change, so if you’re space isn’t working for you, maybe it’s time for a “spring office makeover” for your space. Have a great weekend! This entry was posted on May 12, 2005 at 12:59	and is filed under Productivity. You can follow any responses to this entry through the RSS 2.0 feed. You can leave a response, or trackback from your own site.